TORONTO, March 19, 2014 – Toronto Real Estate Board President Dianne Usher announced that Greater Toronto Area REALTORS® reported 3,459 transactions through the TorontoMLS system during the first two weeks of March 2014. This result for the TREB market area as a whole was virtually unchanged in comparison to 3,464 transactions completed during the same period in 2013. For all home types combined in the GTA, the average selling price was $560,948 - up by almost six per cent in comparison to the average price for the same time frame in 2013. 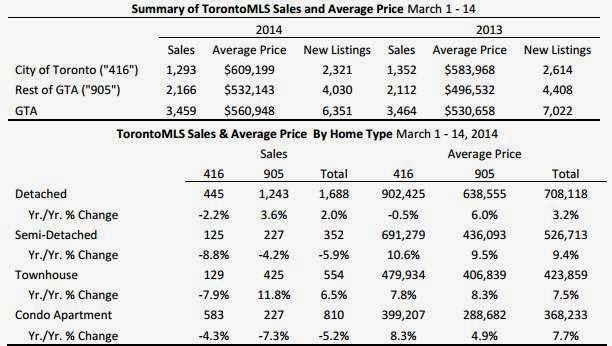 The semi-detached market segment in the City of Toronto led the way in terms of price growth during the first 14 days of March, with a year-over-year increase of more than ten per cent. "Semi-detached houses represent a more affordable ownership option for some households. Because of this, some semi-detached listings have attracted many interested buyers. This competition has served to exert strong upward pressure on the average selling price," said Jason Mercer, TREB’s Senior Manager of Market Analysis.